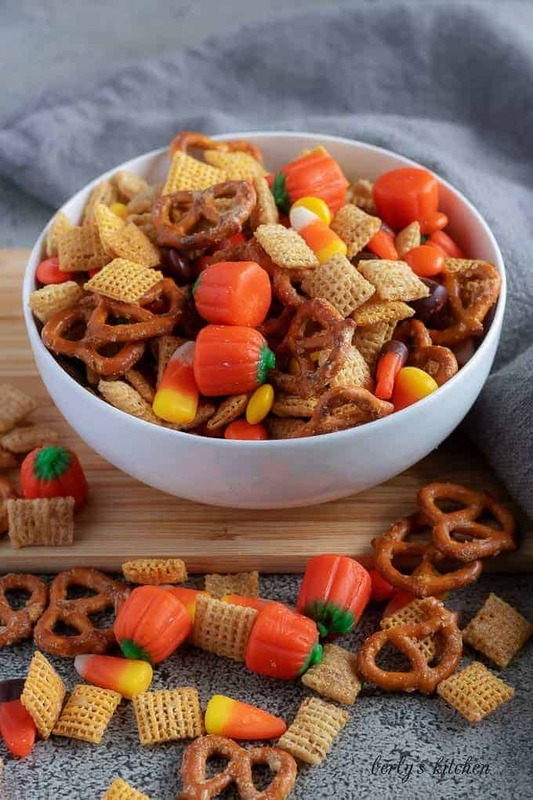 Need for a festive Halloween themed party mix that isn’t going to gross out some of the party goers? Then take a look at our simple, sweet, snack mix. Okay, before you say it, I know there are a lot of people who enjoy the creepy or gross themed Halloween foods. 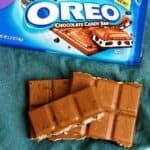 If you like them, then hey, go crazy. There are tons of recipes our there tailored for your tastes. All I ask is that understand that not everyone wants to eat hot dog fingers, candy eyeballs, and spider web pizzas. Some of us, like Kim and I, are bit more sensitive (for lack of a better word), and we get nauseated out by those kinds of dishes. 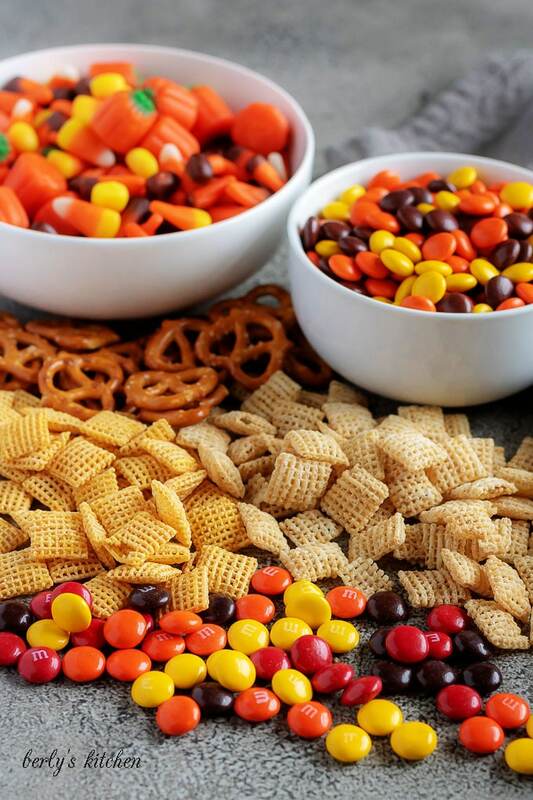 For picky eaters like ourselves, we created a Halloween party mix inspired by everyone’s favorite cereal. 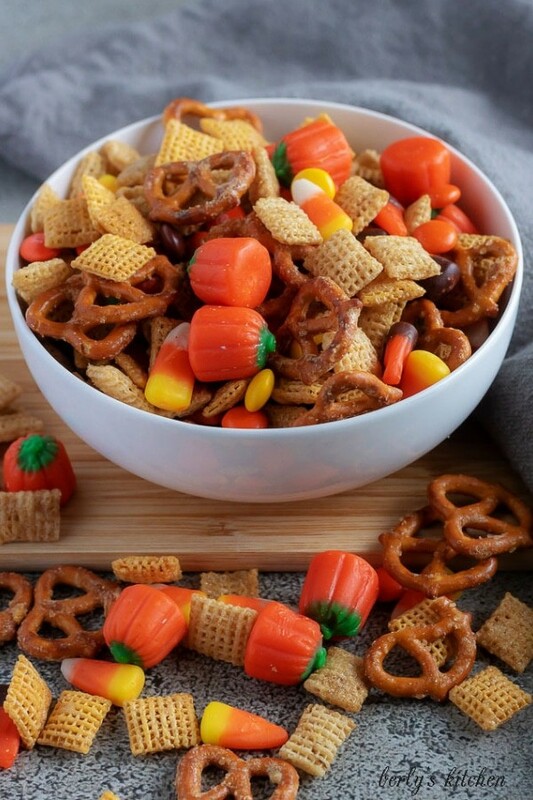 Behold, a party mix based on Chex Mix. However, Kim made took a lot of liberties to make it into a sweeter, candy-filled creation. Instead of the traditional, salty flavor, Kim used a butter and brown sugar glaze to sweeten up the cereal and pretzel concoction. In addition, she add chocolate and peanut butter candies along with candy corn and candy pumpkins. All in all, we think you’ll enjoy it. With that being said, if it’s a little to tame for your Halloween get-togethers, we understand. Let’s get started making this simple snack mix. First, preheat your oven to 275 degrees F. and line 2 large baking sheets with parchment paper. That’s right, 2 large sheet pans, this recipe makes a lot of party mix. Make sure you have plenty of people to share it with this Halloween. Next, in a small microwave safe bowl, melt the butter and brown sugar. After the butter melts completely, add the vanilla. Use a whisk to combine the ingredients until they become creamy and smooth. Please be careful during this step as you’re working with a pretty warm, stick sauce. Don’t get burned! Now, in a large mixing bowl, mix both cereals and the pretzels. Then, slowly drizzle in the brown sugar mixture and stir everything together to coat. After the mixture has been evenly coated with the sauce, spread the cereal evenly onto the baking sheets. 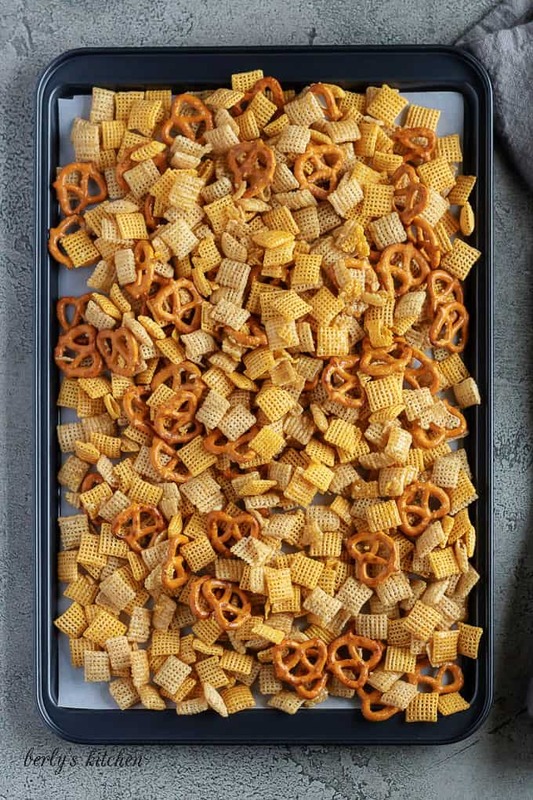 Place the sheet pans in the preheated oven to bake for 45 minutes, stirring the party mix every 15 minutes. So, by the time cereal is cooked, you should have stirred it 3-times. Afterwards, remove the pans from your oven and allow the cereal to cool completely. This should only take about 15-minutes; however, you want the cereal mixture cool before you add the candies. Once everything has cooled, add the M & Ms, Autumn Mix candy, and Reese’s Pieces to the snack mix. Go ahead and give all the ingredients a good stir to combine them. 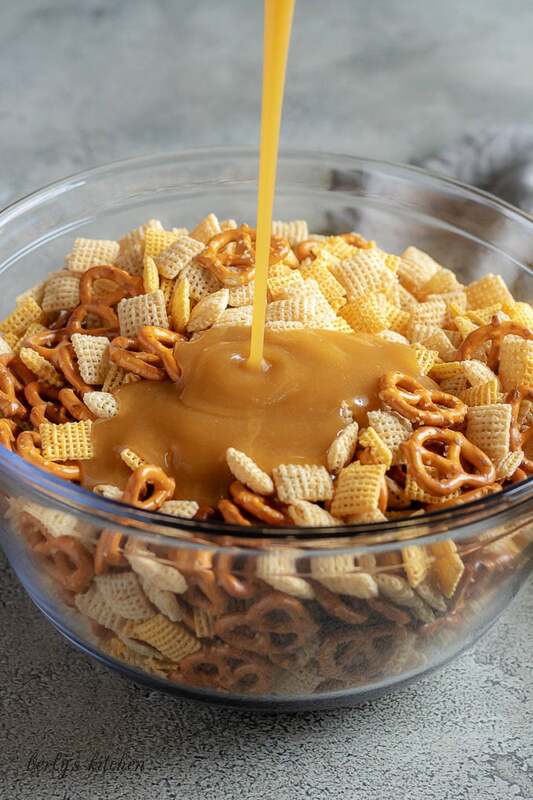 Last, transfer the party mix to a serving bowl or separate it out into a few smaller serving dishes. In the words, serve it however you desire. If there are any leftovers, store them in an airtight container for up to 7 days. You don’t have to refrigerate anything, the snack mix can sit on your counter-top. 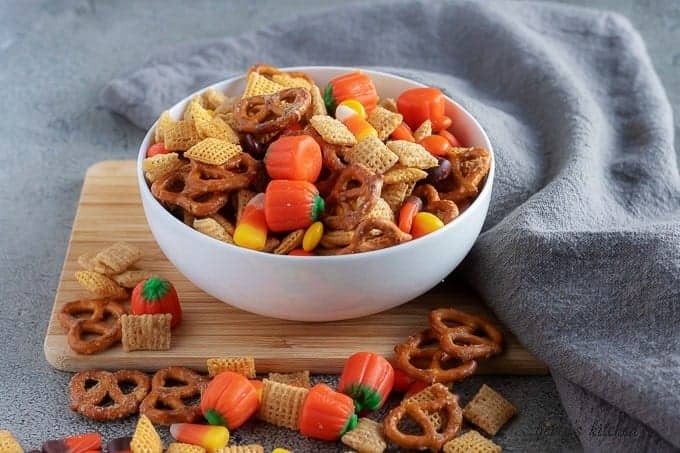 Not a fan of wax candies, then swap out the candy corn and candy pumpkin mixes for another bite-sized treat. For example, peanut M&M’s or even mini peanut butter cups. The main thing is that you make it the way you want it. Use this recipe as a base and go from there. For portion size control, measure out your desired portion size and then store it into Halloween themed baggies or paper sacks. Tie it off with a little rustic kitchen twine and you have yourself an adorable presentation for your snack mix while keeping the portion size in check. For a savory kick, use a butter and season salt mixture instead of the butter, brown sugar, vanilla mixture we used. When combined with candy, it give your taste buds a variety of flavors to enjoy! 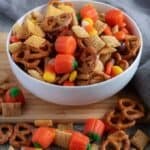 Need for a festive Halloween themed party mix that isn't going to gross out some of the party goers? Then take a look at our simple, sweet, snack mix. First, preheat the oven to 275 degrees and line 2 large baking sheets with parchment paper. Next, in a small microwave safe bowl, melt the butter and brown sugar. After the butter melts completely, add the vanilla. Use a whisk to combine the ingredients until they become creamy and smooth. Then, in a large bowl, mix both cereals and the pretzels. Add the brown sugar mixture, and stir to coat. Afterwards, spread the cereal evenly onto the baking sheets, and place in the preheated oven. Bake for 45 minutes stirring in 15 intervals. Last, remove from oven and allow the cereal to cool completely. Add the M & M's, Autumn Mix candy, and Reese’s Pieces. Stir to combine and serve. Store in an airtight container for up to 7 days. The calories listed are an approximation based on the ingredients and a 1/2-cup serving size. Actual calories will vary. The snack mix can be stored in a sealed container on your counter for up to 7-days.